The Consecration of Bishop Ian. ‘I was fortunate to attend the Consecration of our new Bishop Ian last Saturday at St Ninian`s cathedral. On arrival I received a warm welcome from young James who sings in their choir. It was an uplifting occasion with lovely singing supported by two choirs and a wonderful organ. Music for the Eucharist was written by James Macmillan. Bishop Ian has come from Old St Pauls in Edinburgh so was known by a number of clergy including our former Primus Dr Richard Holloway who gave us a thought provoking sermon. He used the very last chapter of St Johns gospel for his theme, comparing the discipleship of the petulant but lovable Peter, with young John who was also devoted to his Master, and was brave enough to witness the crucifixion and subsequently wrote his profound gospel. They were very different. But, in spite of their inherently different character traits, they were able to use them to good effect. The Primus argued that we are all on this spectrum, with shortcomings and different abilities and gifts but do we use them faithfully as we should in spite of our failings? The liturgy of ordination followed the above, preceded by the hymn “Come Holy Ghost our souls inspire” sung kneeling as a prayer. Then the anointing with oil took place followed by the giving of symbolic gifts of the Ring, Cross, Mitre, Bible , and Pastoral staff, reminding me of similarities with the Coronation of our Queen, seen on TV. Altogether this was a memorable and inspiring occasion. We look forward to welcoming Bishop Ian to The Linkage in due course’. We are seeking donations of tombola and raffle prizes and there is a box at the back of church for that purpose. It would be of great assistance in planning for the day if gifts could be given in good time: thank you for your support. Last Sunday’s concert was well attended and appreciated. The next, on the 16th November promises to be memorable with the visit of the St Petersburg Resurrection Choir. We are indebted to those who make these concerts possible. For some time now, the Vestry led by Christopher and Nick, has been considering making St Mary’s a warmer place to worship but at a more modest consumption of electricity. In 2015 for example, the cost of heating amounted to approximately £2,500 per annum. Three possible solutions have been examined. These are detailed on a story board at the back of church. Two of the possibilities were later discarded leaving the third option as the suggested project. The reasons for choosing the option are detailed on the board. The Vestry is now poised to apply to the Diocese to seek permission for this option to be pursued. However, it is anxious to be assured that before application is made, the congregation is supportive of the steps taken and the choice made. In particular, the Vestry is anxious to be reassured that the proposed ‘chandelier’ heater/light to be placed above the transept is in favour. If anyone has queries or constructive comment, would this please be made known to Christopher or Nick before the 1st December? In the absence of any communication beyond that date, the Vestry will regard the matter as agreed by the congregation and proceed for Diocesan permission accordingly. Richard records his profound thanks for the time and effort taken by Christopher and Nick over this project. The Annual General Meeting on the 9th December will commence with a secret ballot to determine whether the new proposed hymnbook should be introduced. The background to the matter has already been well-documented and the new material offered by the book has been trialled each Sunday since Easter by means of the Sampler supplementary hymnbook. An explanation about the proposed book is contained in the preface to the Sampler. Time constraints will prevent further discussion of this matter at the Annual Meeting. There is little possibility of the congregation being of common mind: personal choice is therefore best expressed by means of the ballot paper. Should though you have a particular query about the proposed book, please inform Richard in writing and in good time before the meeting. The ballot motion will be “Do you accept the offer of a new hymnbook?” The teller of the Ballot will be Mark, who will forfeit his right to vote. The result will be made known at the close of the meeting. St Andrew’s Christmas Fair: see above. This entry was posted in Rector's Bulletin and tagged Rectors weekly Bulletin, Richard Grosse, St Mary's, weekly news on October 29, 2018 by Stmary. The clocks move back one hour this coming weekend. 16.30 Diocesan Choral Evensong in St Ninian’s Cathedral. This will be an opportunity for everyone throughout the diocese to come and welcome and meet our new Bishop, Ian Paton. This is an open invitation to all members of congregations who would like to attend. This entry was posted in Rector's Bulletin and tagged Linkage Bulletin, Rectors weekly Bulletin, Richard Grosse, St Mary's, weekly news on October 22, 2018 by Stmary. Richard has been appointed interim Rector of this parish during interregnum. This will not affect Sunday services in the Linkage. It may necessitate occasional change to midweek events. Consecration of The Revd Canon Ian Paton as Bishop of St Andrews Dunkeld and Dunblane – Attendance by invitation. If you would like to attend, please speak with Richard. O God, by your Holy Spirit you moved Teresa of Avila to manifest to your Church the way of perfection: Grant us, we pray, to be nourished by her excellent teaching, and enkindle within us a keen and unquenchable longing for true holiness; through Jesus Christ, the joy of loving hearts, who with you and the Holy Spirit lives and reigns, one God, for ever and ever. 16.30 Diocesan Choral Evensong in St Ninian’s Cathedral. This will be an opportunity for everyone throughout the diocese to come and welcome and meet our new Bishop, Ian Paton. This entry was posted in Rector's Bulletin and tagged Linkage Bulletin, Rectors weekly Bulletin, Richard Grosse, St Mary's, weekly news on October 15, 2018 by Stmary. Thank to those who decorated the churches and brought gifts of food. This takes place at 15.00 on Sunday 16th December. 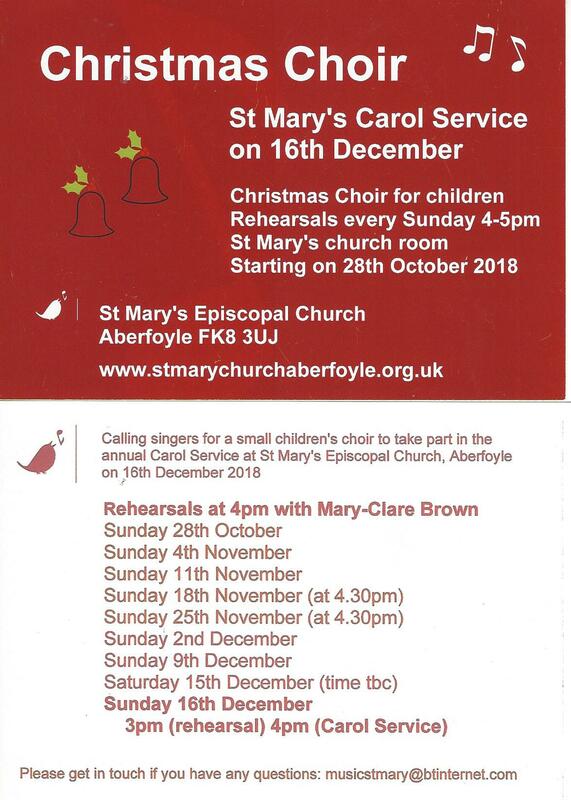 Mary-Clare Brown (07835250753) is seeking singers both for a children’s and an adult choir for the service. If this might be of interest to you or anyone you know, please contact Mary-Clare direct. This entry was posted in Rector's Bulletin and tagged Linkage Bulletin, Rectors weekly Bulletin, Richard Grosse, St Mary's, weekly news on October 8, 2018 by Stmary. Thanks to all who contributed to the Harvest Supper last Friday evening. Harvest Festivals take place this coming Sunday in both parishes. Gifts of tinned food to be donated to Startup Stirling will be especially appreciated. From past experience, fresh fruit and vegetables prove hard to utilise as there tends to be an abundance at this time of year. Thank you for your understanding. This entry was posted in Rector's Bulletin and tagged Linkage Bulletin, Rectors weekly Bulletin, Richard Grosse, St Mary's, weekly news on October 1, 2018 by Stmary.